JOLIET, Ill., Sunday, Sept. 7, 2003 - With a handful of narrow side-by-side wins to his credit, Sam Hornish Jr. made it even more heart-stopping at Chicagoland Speedway in 2003, where he defeated Scott Dixon and Bryan Herta to win the Delphi Indy 300 in the closest 1-2-3 finish in IndyCar Series history. Hornish and third-place finisher Herta were separated by a mere .0100 of a second. He knew he was battling with the Andretti Green Racing driver, but when Herta pushed Hornish up the track on the final lap, he didn't realize Dixon was going to stick the nose of his No. 9 car in the mix for the win. Hornish stuck his hand into the air to celebrate his win a few feet before the finishing line, not knowing that Dixon nearly stole the win. "When I saw the pictures of Sam with his fist in the air I thought it was quite funny," Dixon said later. "I raised my fist because I knew I had Herta beat, but I looked down and saw Scott in there," Hornish said. "I thought, 'Boy I'd hope I beat him because I'd hate to be the guy in a three-wide finish with my hand up thinking I won the race when the guy at the bottom was ahead of me.'" The previous record for a 1-2-3 finish came at Texas Motor Speedway in Oct. 2001 when Hornish defeated Scott Sharp and Robbie Buhl by .0468 of a second. "It's really exciting because you know the fans are getting the show of a lifetime, but it's pretty nerve-wracking," Hornish said. "It was a tough race out there today. A lot of people were very close together. It was probably one of the closest as far as competitive fields that I've ever seen. It's exciting. "The guys at Panther Racing have worked so hard this year; it's really great to take them back to victory lane again. While we're still 41 points out of the championship lead, when you get 52 for winning and leading the most laps, (and) you get 32 for sixth, anything is possible. "We're just going to keep working as hard as we can and see if we can get ourselves back in here." 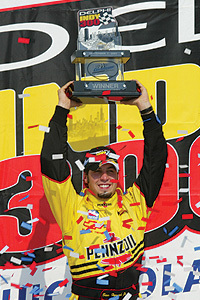 It was Hornish's 10th career IndyCar Series victory and his second of the 2003 season. He won the Belterra Casino Indy 300 Aug. 17 at Kentucky Speedway. The margin of victory was .0099 of a second, the third-closest finish in IndyCar Series history. Hornish defeated Al Unser Jr. in 2002 at Chicagoland Speedway by .0024 of a second and defeated Helio Castroneves in Sept. 2002 at Texas Motor Speedway by .0096 of a second. "It was a pretty rough day out there," said Dixon "The racing was great. It was getting pretty hairy there with three-wide occasionally." Herta, who earned his third consecutive third-place finish, agreed. "It was a pretty adventurous day," said Herta. "I guess it's fun. It would be more fun to watch it on TV. It's high-risk fun, for sure. We just gave it everything we had, and that's how it ended up."